Washington Square provides a culturally rich neighborhood known for its variety of restaurants and shops. The streets are bustling with a diverse mix of people from the neighborhood, including moms with strollers, business people, college students, and local residents out for a daily run. Washington Square certainly has something for everybody. Location: Washington Square is located at the intersection of Beacon Street and Washington Street. It marks one of the central neighborhoods of Brookline, with Coolidge Corner to the East, Brookline Village and Pill Hill to the Southeast, and Fisher Hill to the West. Description: Washington Square flourishes with history. Tappan Street and its surrounding area was once the summer getaway for the wealthy living in Boston. They used the Washington Square neighborhood for their relaxing vacations outside of the city. In addition, Washington Street was one of Brookline’s first roads. The road was used to bring the Brookline’s cattle to the stockyards located in Brighton and Watertown. Washington Square is situated at the bottom of Aspinwall and Corey Hills, two of Brookline’s largest hills, both great for afternoon picnics. The neighborhood also includes the Driscoll School, a K-8 public school. Some of the buildings in Washington Square maintain a historical or Victorian design. However, starkly contrasting, many of the newer structures are quite plain, with very square, simple designs. There are brownstones, new and old apartments and condos, and even a beautiful art deco building on the West-bound side of Beacon Street. Known for the multitude of shops and restaurants, Washington Square has a vibrant and charming atmosphere. The streets are clean and beautifully landscaped, keeping Washington Square aesthetically appealing. During the day, the neighborhood is busy but comfortable, maintaining a pleasant hubbub of people and activity. At night, when the weather cooperates, Washington Square really comes alive, as the neighborhood is filled with people dining at the various restaurants or simply enjoying an evening stroll. Washington Square keeps the city atmosphere while maintaining a sense of community. How to get there: Washington Square is easily accessible via many means of transportation. The MBTA’s T subway system, specifically the Green Line “C” branch, runs directly through Washington Square. The best stop to get off is Washington Square Station on Beacon Street, depositing you in the heart of Washington Square. Additional nearby stops include Fairbanks Street, Tappan Street, and Dean Road Stations. Bus 65 also allows easy access to Washington Square. (Bus 65 – Brighton Center – Kenmore Sta. via Washington Street, Brookline Village & Brookline Avenue). By car, both Washington Street and Beacon Street provide easy access to Washington Square. Parking: Parking is sometimes hard to come by, but there are still plenty of options. Although there are no parking lots in Washington Square, the nearby station Beaconfield T station provides a small lot. In addition, a great deal of metered parking spaces line the train tracks up Beacon Street. There are also many parking meters located along the sides of the road on Beacon Street and Washington Street. Places to live: A variety of housing is also available in Washington Square. Beautiful single family homes inhabit the surrounding streets off of Washington Street and Beacon Street. The streets present perfect neighborhoods and locations for families, with several nearby parks, including Griggs Park and Schick Park, as well as Driscoll School, which has a field, basketball courts, and two tennis courts. Washington Square includes a great deal of brownstones and apartment complexes. Apartment complexes can be found directly in the center of Washington Square on both Washington and Beacon Streets, or also more privately tucked away on side streets. Washington Square’s largest condo complex, Washington on the Square, provides multiple studio, 1 and 2 bedroom condos. Shops and restaurants: When walking the neighborhood for Washington Square shopping, you can find a shop for almost anything you need. Services range from dry cleaners, shoe repair, multiple hair and nail salons, to the Cambridge Eye Doctor. 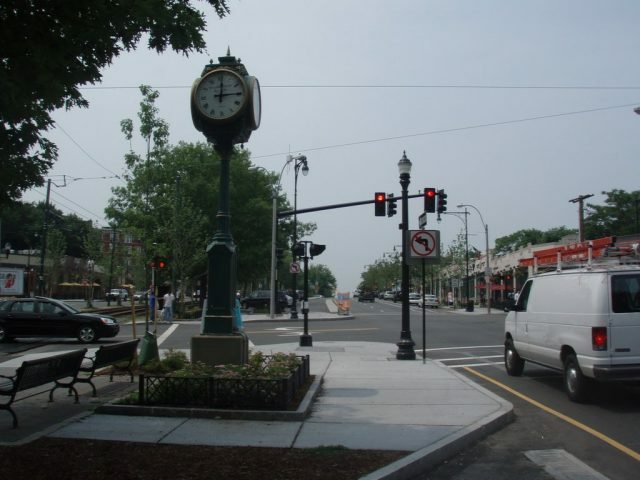 Shops are located along Washington Street and Beacon Street to provide you with whatever goods you need, including your old-fashioned hardware store, sports-needs store, home and garden store, convenient stores, and of course, lots of banks and ATMs, including Brookline Bank. In addition to the surplus of shopping available in Washington Square, the neighborhood has a large selection of restaurants. For whatever flavors your taste buds desire, Washington Square has a restaurant to satisfy any craving, including Thai, Chinese, Italian, Japanese, and American Grill. Over the last couple of years, many of the restaurants in Washington Square have added outdoor seating including The Golden Temple, The Abbey, The Fireplace, and Washington Square Tavern. The Abbey offers a varied menu for lunch, dinner, drinks, or late night. Small cafes and bakeries line the streets, allowing you to grab a coffee to-go or stay and enjoy a relaxing lunch. There is even an Emack and Bolio’s ice-cream and Athan’s Bakery to satisfy that sweet tooth. If you are looking for provisions to take home with you, Washington Square can still cater to your needs. The neighborhood includes a large supermarket as well as a nearby Whole-Foods market, in addition to a liquor store and store dedicated to fine wines. The shops, the restaurants, the people; they all bring life to Washington Square. The large number of outdoor seats has created a “mini-Newbury Street” feel to Washington Square. With the nightly crowd of people dining outside and enjoying warm summer nights on the street, Washington Square establishes itself as a neighborhood of elegance and comfort.